Taking its’ cue from the fictionalized speeder bike seen in Star Wars: Revenge of the Jedi, the US Army, in conjunction with prime contractor Malloy Aeronautics, debuted a work-in-progress man-portable hoverbike at the Paris Air Show. According to MSN News, “Malloy Aeronautics was testing hoverbike technology with a robot-carrying drone. 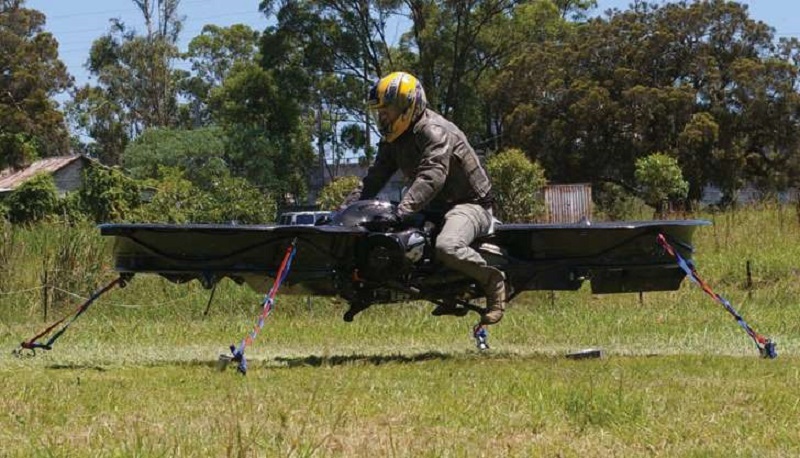 A few months later, it’s partnering with a Maryland-based defense company to develop a hoverbike for the US military. Working with Survice Engineering Co., the UK aeronautics company will set up shop in Maryland as part of “an ongoing research and development contract.” The duo will also work with the US Army Research Laboratory on the project that aims to create “a new class of Tactical Reconnaissance Vehicle (TRV). No word as yet as to the carrying capacity, speed or altitude it can reach, and whether or not the vehicle can be weaponized with a lightweight anti-personnel or anti-armor combat system for close assault beyond its surveillance capabilities. Obviously, there are commercial applications implied by its development, as thrill seekers armed with the latest Go Pro modular filming device takes the vehicle through its paces off road in varying environments and conditions. Likewise, the vehicle can serve as a mobile search-and-rescue system, capable of crossing terrain that a surface-going vehicle might have trouble negotiating.